John Thomas Rhamstine, from what little I've been able to ferret out, appears to have been a relatively small manufacturer based in Detroit, Michigan. I believe his bread-and-butter was electrical piece-parts for radio, but I'm not sure. 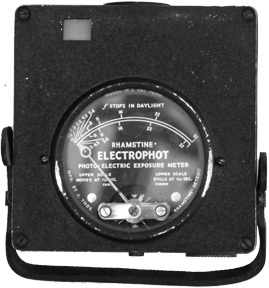 Regardless, from the early 1930s to the early 50s, Rhamstine sold photoelectric light meters under the name Electrophot. You know how everything is listed as being "rare" on eBay? These actually are. They are around but you simply don't see them for sale very much. They weren't big sellers—not in the Weston, General Electric, DuJur league from that era—and they didn't buy big national advertisements, and they didn't get much ink in the photo magazines. So unfortunately, it's very difficult for me to piece together what's what, other than what I've been able to find here and there. Forgive me if this is particuarly vague and filled with qualifiers, but I'd rather be honest and accurate than authoritative and wrong. Rhamstine is often credited with inventing the first photo-electric meter around 1932—and this is it. It is big and heavy (more than you'd want hanging around your neck or weighing down a coat pocket). It could be used in the field, but it's obvious it was meant for studio use where it would spend most of its time on a tabletop and wouldn't have to be lugged around. Personally, I think the first "real" photographer's exposure meter was the Weston 617, and explain why I think so in "Who Invented the Exposure Meter?" Actually, it's a direct-reading reader meant for movie work. If you're using a popular film stock with a standard shutter speed, the face reads out in ƒ/stops. You need to consult the table on the back (or in a booklet) to convert it for other uses. One of the great ironies of history is that this meter was about 30 years before its time. All these meters used selenium cells to measure the amount of light striking them. But whereas Weston, Gossen, General Electric, DeJur and the others used photovoltaic cells which generated current that could be measured with a milliammeter, Rhamstine used the cell as a photoresistor: he applied electrical current across it and measured the amount of resistance across the cell using an ohmmeter. This solution required a battery, which were kind of like automobile batteries are today: big and inefficient. So while Rhamstine had all this extra size and weight, his competitors made much smaller units which were more attractive to photographers in the field; and they ate his lunch. Subsequent Electrophots (like my model 14-A) were photovoltaics. In the early 1960s the cadmium sulfide (CdS) cell came out and it was a photoresistor. They used little button batteries so the meters were as small and light as the contemporary selenium models, and they blew the selenium cell meters out of the water almost overnight. If Rhamstine had been able to downsize his meter and run it off a button-battery, things might have turned out very differently. Now, about this particular meter. It appears that the model DH (and DHA) is the original one which took a battery. The DHA looks identical to the one I have above, except that the meter grid is a Gripenberg cell rather than a Fritts. When Weston followed with their own photoelectric, the Model 617, they realized that the battery was a big handicap. Rhamstine redesigned the meter to use the Fritts cell and eliminated the battery, but for whatever reason—I think it was probably to use up their inventory—they put the new design in their existing case, and called it the Model M-S. That's the one I have pictured here. The M-S still has the battery cover and the hardware inside to hold it, but it isn't actually used. Rhamstine then redesigned it again, this time with a much smaller, lighter case, and called it the M-S-A and M-S-B.